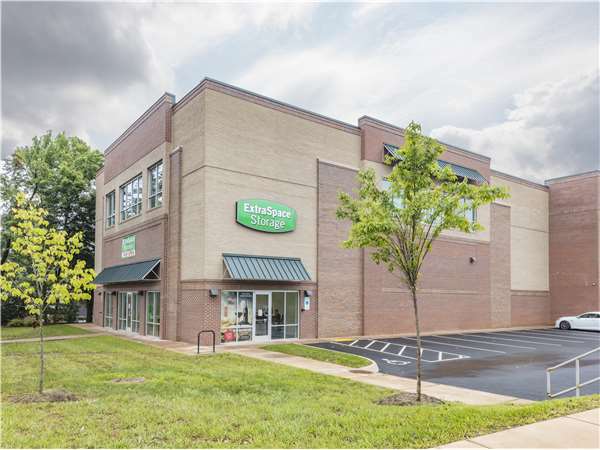 Located near the intersection of Hydraulic Rd and Inglewood Dr, Extra Space Storage serves Charlottesville residents near Barracks, Commonwealth, and Wildwood. Locals will recognize our facility a few minutes from The Shops at Stonefield and Regal Cinemas Stonefield 14 & IMAX. Extra Space Storage is about 2.4 miles from the University of Virginia campus, so we're a convenient option for college students in Charlottesville who need summer storage or storage while studying abroad. With a wide range of storage unit sizes, climate-controlled storage, drive-up access, and more, Extra Space Storage on Hydraulic Rd is the solution for your residential or commercial needs in Charlottesville! Our Charlottesville storage facility has unit sizes from 25 square feet up to 250+ square feet with convenient features like indoor access, drive-up access, and more to handle a variety of needs! At Extra Space Storage, your security is our top priority. Our Hydraulic Rd storage facility has an on-site manager and 24-hour video surveillance to provide the secure environment and peace of mind you want. Store sensitive items safely all year long in a climate-controlled storage unit! This feature keeps your unit between 55 and 80 degrees, preventing extreme heat and humidity from damaging your belongings. Save time and energy with the ultimate self storage convenience: drive-up access! With drive-up access, you can pull a vehicle right up to your unit to unload and load items without hassle. Are you looking for secure wine storage in Charlottesville? Extra Space Storage on Hydraulic Rd offers climate-controlled units specifically for storing wine collections. Contact us to learn more! Extra Space Storage has the self storage amenities, affordable rates, and excellent customer service you want! We maintain a secure, clean facility at all times, and our friendly, professional staff is more than happy to answer your questions. Contact us today to reserve a storage unit in Charlottesville! I walked in and Heidi assisted me right away. What really appreciated was she didn't try to automatically sell me something I didn't need. She asked me what brought me there and LISTENED TO ME!! She showed me two possible selections on the computer then she walked me thru and showed me available selections. I was very satisfied!!! THANKS HEIDI!!! Great location. Spaces are clean, very accessible and the service personnel are knowledgeable and very helpful. The pricing is not the best but the location and facility are compensating factors. Great location, easy access and good price. Storage units are clean, as advertised and easily accessible. Staff is exceptionally pleasant and helpful. I would highly recommend this company and site. Clean, good access, elevators and roller trucks to make moving your stuff easier. First rate staff who go out of their way to help. Bring a lock, the cylinder locks they sell you are a pain to use. Also, bring a can of WD40-- the hasps are still new enough to need greasing when you try to open them. The best deal around for your self-storage needs! I looked all over town for a 10x10 climate-controlled storage facility, and ExtraSpace Storage was by far the least expensive and the most convenient. The staff is extremely helpful and friendly and the security features are top notch. I could not be happier with the experience. Staff is courteous,friendly very professional. The facility very clean. Good access to facility. Hand carts if you need for moving in or out . What amazed me the most was the friendly staff and how neat and clean the storage units are. The location is excellent! If you need a storage unit, you come to the right place. We just moved to Charlottesville and needed to store furniture and some boxes until we found a permanent living space. The staff member was friendly and helpful! She helped us find exactly what we needed and for a great price. I would highly recommend Extra Space Storage. The facility is clean, the employees are friendly and helpful and the units are easy to get to. There are carts to help you move things to and fro and space for parking large moving trucks. I am in between leases for two weeks, and Extra Space Storage offered a great deal - first month free. On top of that, the local manager in Charlottesville was extremely kind and helpful on the phone. I described my situation, and she said she would work with me in the event something went wrong with my new lease and I needed to keep my belongings in the unit for a little longer (either providing a few days leniency or prorating if I needed an extra week). The facility is also very nice and safe! Most units are climate-controlled and they provide moving dollies and elevators in the event you get a unit on one of the top floors. These amenities made moving in super easy! Additionally, the facility provides extra security beyond just locked units. They have keypads where you can only get in if you have a unit. All-in-all, I would definitely recommend Extra Space Storage! Great Facility, Great Management, and Peace of Mind! I chose Extra Space Storage to store my belongings when I was between apartments. I was so impressed with the ease of online booking, friendliness of the staff, and cleanliness of the units. Very efficient to get unit. Space is clean and easy to access, but secure. Very friendly and helpful staff. Facility and individual units are very clean and well-maintained. Would highly recommend for your storage needs. The facility is clean, well maintained, and climate controlled. There are always plenty of loading carts. Access is easy and convenient. Staff is friendly and helpful. Very friendly staff, but the unit itself was extremely dirty. very difficult to navigate the hallways. no proper signage. Very clean and easy access. The staff was most helpful. Friendly service, close to UVA, easy to use, clean and well lit. We are extremely satisfied! I loved the service of the people who worked there! they were super friendly, very helpful, and helped me out a lot with the leasing process. They were also really easy to get in touch with over the phone which is always a plus. New facility with easy access and great staff. The storage unit is well lit and there are ample carts for moving boxes. Can park very close to door for weather. This is by far the easiest process of getting a rental unit. Upon arrival I was greeted with a smile which goes unseen far to often. My sales rep was very friendly and chatty, connected really well and looked for cues. She’s smart! Those kind of things are noticed and appreciated. The facility was spotless, easily accessible and convenient to where I’m located. Keep up the great work! Professional, courteous,knowledgeable staff. Facility was very clean inside and out. I love the climate control units! Convenient location. Very friendly staff. Clean. Parking area is narrow for moving vans although driver of 18-wheeler was able to maneuver the truck. Great location for UVa. Recommend in terms of location, cleanliness, security, and customer service! Clean facility great location, staff friendly and helpful great lighting. Good hours. Clean, reasonably priced, storage unit with very pleasant and helpful staff. The unit and store are very clean and easy to access. Charlie, the manager, was very friendly and easy to work with as well. We look forward to filling up our unit and settling in. Nice new facility. Convenient location. Reasonable prices. Excellent customer service. Drive southwest on Seminole Trail. Turn right onto Hydraulic Rd. Our facility will be on your left at the corner of Inglewood Dr.
Drive northeast on Emmet St N. Turn left onto Hydraulic Rd. Our facility will be on your left at the corner of Inglewood Dr.
Drive northwest on US-250 W. Turn right onto Hydraulic Rd. Pass Trader Joe’s and continue northwest. Our facility will be on your left at the corner of Inglewood Dr.
Drive east on US-250 E. Take the exit for US-29 N/Washington. Merge onto Emmet St N. Turn left onto Hydraulic Rd. Our facility will be on your left at the corner of Inglewood Dr.